The issue of recognising and possibly rewarding accomplished practice is discussed. Then the concept of incentivisation is considered followed by examples of schemes to incentivise sustained programmes of professional learning including schemes for chartered teacher status. The use of rewards and sanctions to improve practice is examined and the question whether such approaches should be on the basis of the performance of an individual teacher or on a collective basis is considered. 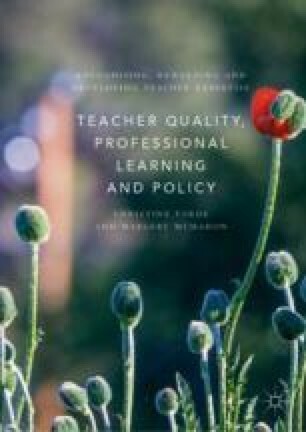 Focusing largely on the individual teacher can reinforce the individualism and isolation of professional practice and development. Schemes for collective development are spotlighted. Audit Scotland. (2006). A Mid-Term Report a First Stage Review of the Cost and Implementation of the Teachers’ Agreement: A Teaching Profession for the 21st Century. Edinburgh: The Audit Unit. http://www.gov.scot/Resource/Doc/285174/0086635.pdf. Chartered College of Teaching. (2017). Chartered Teacher Programme. https://chartered.college/chartered-teacher. Chartered London Teacher. (2010). Chartered London Teacher. http://www.clt.ac.uk/. Egan, D. (2009). Evaluation of the Chartered Teacher Pilot in Wales. http://www.gtcw.org.uk/gtcw/index.php/en/4.